Here are a few of our favorites, but check out PoulinGrain.com for this type of detail about all of their products . 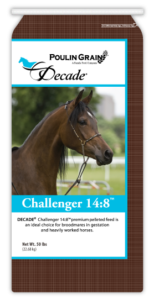 . .
A one-of-a-kind textured feed designed to maximize athletic performance in both training and racing. PROMOTES GUT HEALTH. EQUI-PRO® Super Premium Horse Feeds are scientifically balanced for the current phase of life of your horse. Formulated in these feeds is research on growth, energy, digestion, and absorption of nutrients. A scientifically formulated pellet which balances nutrient profiles of unfortified grains and allows for feeding program flexibility and use of bulk grains. (formerly EQUI-PRO MVP). 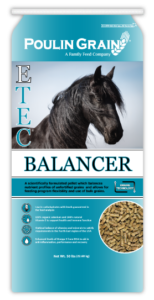 E-TEC® Super Premium Horse Feeds contain the latest science based technology to provide horses with a low carb performance line of feeds. 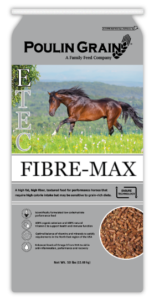 A high fat, high fiber super feed for performance horses that require high calorie intake but may be sensitive to grain rich diets. Suitable for every life stage, including seniors. Powerful antioxidants – Organic selenium and increased levels of natural vitamin E to boost immune function. Omega 3 fatty acids – Enhanced levels to aid in anti-inflammation and muscle recovery. Live cell yeast stabilizes gut bacteria, stimulates digestion and nutrient absorption to improve overall gut health. Increased protein with added lysine aids in topline and overall muscle development. 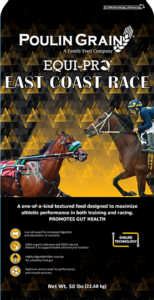 Fresh, fixed formulas – Consistent and highly palatable nutrition designed to support the unique needs of the northeast region of the US.